Synopsis: The town of Maidstone became indelibly associated with revolution and riot between the 14th and 16th centuries when it experienced the Peasants' Revolt, Cade's Rebellion and the Wyatt Revolt. The townsfolk seem to have enjoyed an independant spirit ever since. Following the Battle of Maidstone, fought between Parliamentarians and Royalists in 1648, the Mayor was Clerk to the court which tried Charles I and it was probably he who pronounced the death sentence. Town meetings voiced opposition to the Revolutionary War with France, and urged the King to dismiss Pitt the Younger and his ministers, but the local population was patriotic. When the threat to the country became apparent the people speedily raised a regiment of Volunteers to defend the homeland. Maidstone artisans were prominent in the Swing Riots of 1830. The town was a centre for the fulling process, essential to cloth production, and for a long period enjoyed a virtual monopoly in threadmaking. It also provided local ragstone for the Tower of London and Windsor Castle Chapel and became, in time, a major source of hops and fruit. Brewers such as Fremlins and Style and Winch were situated here, as were producers of Hollands gin and cherry brandy. Papermaking was an industry of local importance. Sharps toffee, Fosters Clarks grocery lines, Tilling-Stevents buses and Rootes, who built the first Singer car in 1912, were among national names that began life in the town. Penenden Heath has been the county meeting place and the spot from which justice was dispensed since before Domesday, so it was appropriate that Maidstone should eventually become the county town for Kent. Nowadays the county administration and public services are centred here and they have largely replaced the former industries, which have all but disappeared. But the town is proud of its long and rich history and this fully illustrated account helps explain precisely why Maidstone has been such an important town in south-east England for over a thousand years. 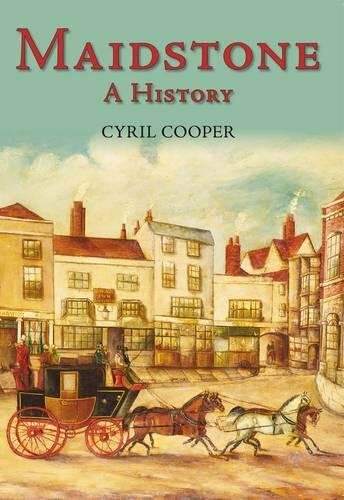 About the Author&colon; Cyril Cooper studied Kentish History at the University of Kent, where his doctoral thesis examined 'The Impact on the County of Kent of the French Revolution, 1789 - 1802'. Most of his working life has been spent in and around the civil service, latterly as Deputy General Secretary of the Institution of Professional Civil Servants. He also participated in the work of the International Labour Office in Geneva. Cyril Copper has a diploma in Kentish History.